Can I see a sample of my invitation before I place an order? Of course. We actually recommend that you see and approve the sample before proceeding with the order. We usually send out a digital proof and if approved, you can receive a physical sample showing the paper stock and true color. We emphasize personal service and don’t want our customers to be surprised. How do I send my photo if I want to include one on an invitation or announcement? Yes, we suggest giving one to someone special. 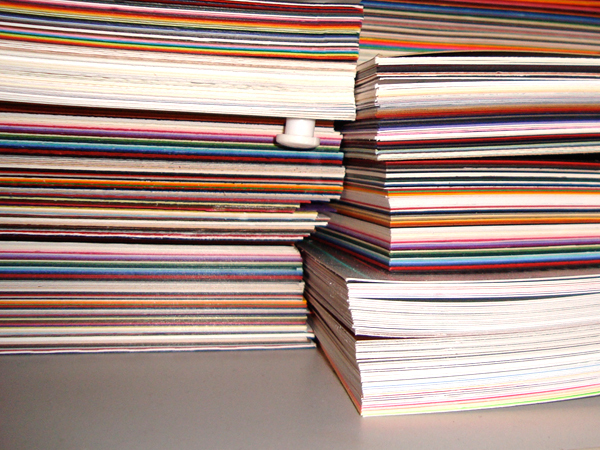 We offer various colored card stocks in a linen or matte finish, vellum, or metallic. Because we can’t keep everything in stock, time is needed to order materials as well as print the final products. Any invitation can be single, double layered or triple layered, depending on the color theme and style of your party. What is the difference between a Design Modification and a Custom Design? Modification means you can sort through all of our existing designs…birthday invites, baby announcements, showers, etc. and pick a design you like. We can change text and colors to coordinate with the event for no charge at all! If you see one you like, let us know what you would like to order and you can discuss your ideas for modifications. Once we receive your order, we will send you an email proof and you can see if we got it right. If approved, we can send you out a physical proof to see the quality and true color. Custom design is if you don’t see a layout that fits your specific needs, we can work with you to incorporate your ideas. We will hopefully come up with something that suits your needs and can carry across to other package items. Do I need extra postage for any of your products? Depending on the size, yes. If you choose a square invite/envelope there is an add’l charge of $.17 postage. You will be informed of the postage amount upon completion of the order. For the 5×7 cards there is no additional postage. What if I’m not happy with the final product? After you have approved the digital proof and we have begun printing we offer a 75% refund. If the order has been shipped to you we will need everything returned (we will also pay for shipping). Up to that point, you can quit the ordering process at any time. If you need a reprint after the digital proof has been approved and the reason for the reprint was visible on the proof (wrong phone number, wrong photo choice, party details, spelling, etc…) we charge a 50% fee plus you will have to pay for shipping. Keep your envelopes because we won’t send more with a reprint.